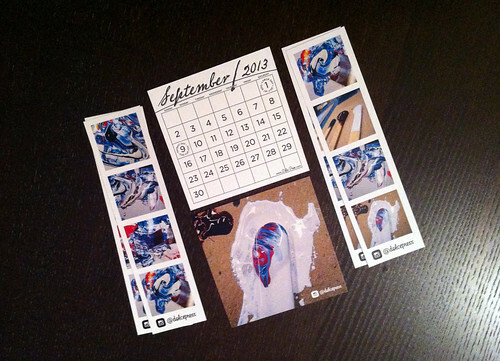 Our inky calendar #TypeCard for September is awesome! We've been busy recently getting a brand new piece of equipment up and running at the shop. Our monthly #TypeCard series was the perfect thing to show off what the press can do and how it can complement letterpress work. This month we produced a limited edition #TypeCard with photos of our ink mixes on the back and a letterpress calendar on the front. We had extra room on the photo sheets so we printed out some nifty photo strips too! As always these cards ship free with every order until they run out. Check out all of the photos after the break.